According to Statistics Estonia, in 2018, the labour force participation rate was 71.9%, the employment rate was 68.1% and the unemployment rate was 5.4%. The number of long‑term unemployed was the lowest of the last 20 years. In 2018, the annual average number of active persons in the labour market was 702,400, which is 3,600 more compared to 2017. The number of employed persons was 664,700, increasing by 6,100 compared the previous year. The annual average number of unemployed persons was 37,700, which is 2,600 less than in 2017. Unemployment decreased in all age groups. The unemployment rate among 25–49-year-olds was 4.5% and among 50–74-year-olds it was 5.2%. One of the goals of Estonia 2020 competitiveness strategy is bringing the unemployment rate among young people (15–24-year-olds) down to 10%. In 2018, the goal was not yet fulfilled, but the unemployment rate among young people decreased y-o-y, and was 11.8% in 2018. The European Union average unemployment rate in the 1st to 3rd quarter of 2018 stood at 7%, indicating that Estonia is among the countries with lower unemployment. 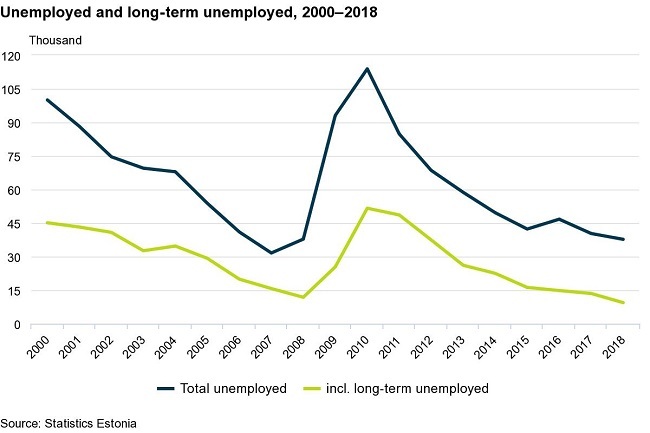 In 2018, the number of long-term unemployed (who have been looking for work for 12 months or longer) was 9,400, which is the lowest of the last 20 years. The last time that the number of long‑term unemployed was at a record low was in 2008. Compared to 2017, the number of long‑term unemployed decreased by 4,100 in 2018. The long-term unemployed are considered to have the highest risk of poverty among unemployed persons. The reason is that staying out of the labour market for a long time can have an impact on the person’s work skills and habits. The number of inactive persons in the labour market continues to fall. In 2018, the number of inactive persons in the labour market was 274,300. The main reasons for being inactive were retirement (88,400), studies (65,000), illness or disability (59,800) and maternity or parental leave (26,000). The decrease in the number of inactive persons is affected by the Work Ability Reform as well as the increasing activity of retirement-aged persons in the labour market. It is also possible to provide data on persons available to work but not seeking by reason of inactivity. These are persons who are not actively looking for work but are available for work immediately if work was offered. There were 30,800 such persons in 2018. Among them, retirement-aged persons (7,300) and persons inactive due to illness or disability (7,600) were the most numerous. Part-time working has become more popular. In recent years, the number of part‑time workers has been on constant increase. It reached a record-high number in 2018, with 82,000 part-time workers, which is 10,900 more compared to 2017. Women are the most likely to work part-time (54,700), and there were 27,300 men working part-time. The number of underemployed persons has also increased. A person is underemployed if he/she works part-time but would like to work more and is available for additional work immediately (within two weeks). In 2018, the number of underemployed persons was 7,300, which is 2,600 more than in 2017. In the 4th quarter of 2018, the labour force participation rate was 72.3% and the employment rate was 69.1%. Compared to the same quarter of 2017, these indicators have increased. The unemployment rate in the 4th quarter of 2018 was 4.4%. The last time the unemployment rate was even lower (4%) was over 10 years ago, in the 2nd quarter of 2008.